One of the more intriguing artifacts recovered from Toltec Mounds is a fragment of a carved stone bird effigy, identified as an owl, measuring only 4 centimeters long. Recovered from the surface of the site after the leveling of Mound G sometime prior to 1955, the effigy is mentioned only briefly by Martha Rolingson (2012:163). While unique for the site as both a carved stone effigy and depiction of an owl, it is not the only bird effigy ever recovered at Toltec Mounds. It is not completely clear why birds, and especially owls, would have been depicted in the art of the Plum Bayou people. 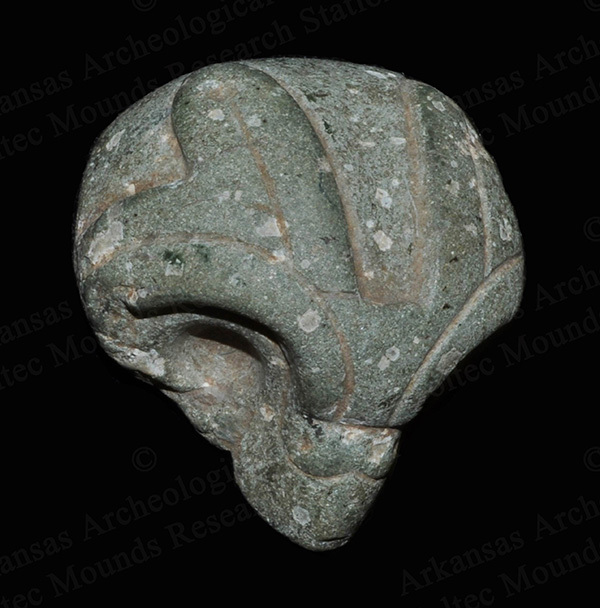 Fragment of a carved stone bird effigy recovered at Toltec Mounds in central Arkansas. Plumes along the top of the head indicate that the ancient artist was influenced by one of two different species of owls in the Southeast, the Great Horned Owl or the Eastern screech owl. 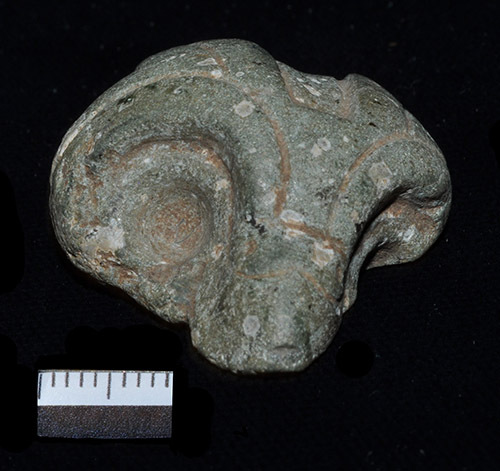 What we do know is that the carving was made from a lithic source, trachyte, that Plum Bayou people used with some regularity for other kinds of stone tools from plummets to pestles. Trachyte—along with some additional lithic sources used by Plum Bayou peoples, such as magnetite, hematite, quartz crystal, and lamprophyres—can be found in some of the geological deposits of the Ouachita Mountains, particularly in the area known today as Magnet Cove. Whether people from Toltec Mounds traveled to the uplands to mine these lithic sources, or traded with villages and hamlets in the area, the Ouachita Mountains source for the raw material of the carved stone fragment indicates it was produced relatively locally, either at Toltec, or at a location that would have been only a few days travel at most. The carving itself is skillfully and artfully done, with big, round, forward-facing eyes, plumes or “ears” that lay back along the top of the head, and the area above the eyes and along the plumes inscribed with fine lines terminating in small dots. The beak of the bird depicted was probably hooked downward, as owls’ beaks are, but today that portion of the effigy is damaged and missing. These features combined strongly suggest the bird being depicted was an owl. Additionally, plumes along the top of the head indicate that the ancient artist was influenced by one of two different species of owls in the Southeast, the Great Horned Owl or the Eastern screech owl. The fine lines and terminating dots that gracefully highlight the carving are also reminiscent of the artistic style of some decorated ceramics, known as “French Fork Incised,” from Plum Bayou sites. The production technique used to make the little effigy is called “ground stone.” The artist would have used slightly harder hammerstones to gradually peck and pound away excess material, first roughly shaping the object, then refining it, and carefully adding in the fine lines and terminal dots that accentuate the bird’s face. Eventually the effigy would have been smoothed using a gritty stone like sandstone, until it was perfectly smoothed and shaped. The owl effigy is broken right at the neck of the bird, leaving just the owl’s face. We do not know what it was a part of—a pipe, a carved plummet, an ornament, or a boatstone? All of these Woodland period artifact types have examples with extremely finely executed effigies and carved decorative surfaces. Front view of the Toltec Mounds owl effigy. The scale is in millimeters. Birds, including owls, figure prominently in the ancient art of Eastern North America and frequently play important roles in sacred traditions and oral histories. With so many cultures spread over thousands of years, it is difficult to know what this owl may have meant to the Plum Bayou people who held and used it. Owls—silent nocturnal hunters--have often been viewed as representations of prophecy, harbingers of omens, as well as guardians or shepherds of souls, or even the manifestation of souls themselves. For some cultures, they are omens of death, and dangerous to encounter, while for others they are protectors, informants about future events, and a source of important sacred knowledge. In Caddo oral traditions, the character of “Medicine-Screech-Owl” is both a slayer of monsters and a healer (Dorsey 1905). Among the Osage, Ponca and Omaha, owl feathers have an important role in the form of the Calumet pipe, used, among other things, to communicate to the spirit world the intent of human ceremonies (Hall 1997). The Quapaw also use owl feathers in sacred contexts, as do many other Southeastern Native peoples. For the Arkansas Archeological Survey Toltec Mounds Research Station, owls have become crucial to our long-term research into Lost Crops, and Late Woodland agriculture (Mueller et al. 2017). Shortly after the creation of the Plum Bayou Garden at Toltec Mounds State Park, a pair of Great Horned owls took up residence in the woods near the garden. They use the garden to hunt and to train their fledglings every year. They, and their offspring, have helped keep the rabbit and woodrat populations that eat our seeds and plants under control, making them welcome and well-respected assistants to the research and interpretative garden. Whatever the meaning and functional role of the little carved owl at Toltec Mounds, its artful production and final deposition at Mound G indicate its importance for Plum Bayou peoples. Today, you can see the carving in the museum at Toltec Mounds Archeological State Park, and you might hear, or even see, the owls who live near the Plum Bayou Garden. 1905 Traditions of the Caddo. Carnegie Institute of Washington, Washington DC. 1997 An Archaeology of the Soul: North American Indian Belief and Ritual. University of Illinois Press, Chicago IL. 2017 “Growing the Lost Crops of Eastern North America’s Original Agricultural System” Nature Plants 3 (17092). 2012 Toltec Mounds: Archeology of the Mound-and-Plaza Complex. Research Series no. 65, Arkansas Archeological Survey, Fayetteville, AR. In this series, we feature select artifacts that are extraordinary both for the context of their discovery and for their unique qualities that contribute exceptionally important information about Arkansas culture and history. New artifacts will be added monthly throughout 2018. Find the list of artifacts here.